A 9/11 Anniversary motorcycle ride will have major impacts for motorists driving Friday afternoon on the eastbound Dulles Toll Road as well as those leaving Dulles Airport, according to the Metropolitan Washington Airports Authority. The ride is being organized by America’s 9/11 Foundation, Inc., which expects more than 1,800 motorcyclists to ride from Shanksville, Pa., to the Pentagon and then on to New York City to the site of the World Trade Center, said the MWAA. 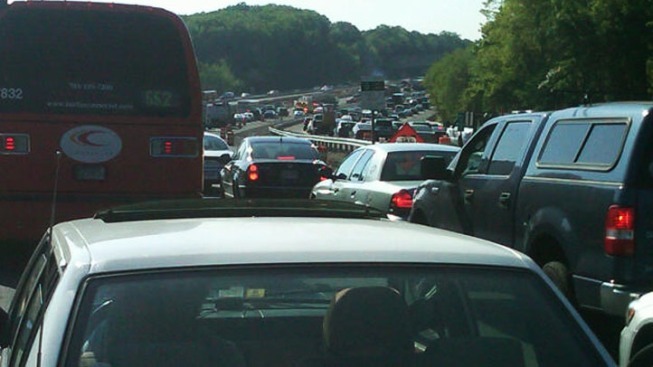 MWAA said the ride will cause delays eastbound along the Dulles Greenway, the Dulles Toll Road, the Dulles Airport Access Highway, and Interstate 66 during Friday afternoon’s commute. From Route 28 to Route 7 in Tysons Corner, the two LEFT eastbound lanes of the Dulles Toll Road will be reserved for the motorcycle procession. Just before Route 7 (Leesburg Pike), the motorcycle procession will leave the eastbound Toll Road and travel on the Dulles Airport Access Highway. From there, it will continue onto Interstate 66 eastbound using the Dulles Connector Road. All regular eastbound traffic, including taxis, commuter buses and Washington Flyer Coach Service, will be excluded from this route. The eastbound Dulles Connector Road leading to eastbound Interstate 66 will be CLOSED TO ALL TRAFFIC except the motorcycle procession. This closure will also extend to taxis, commuter buses and Washington Flyer Coach Service. All motorists on the eastbound Dulles Toll Road will only have access to ramps leading to Interstate 495 (Beltway) North or South once they pass the Main Toll Plaza. Expect heavy congestion in this area and avoid it if possible. Because eastbound I-66 will be closed from the Dulles Connector Road to Rosslyn, motorists from Maryland and Virginia heading to Reagan National should allow extra time to reach the Airport along alternate routes. Westbound lanes on the Dulles Toll Road and the Dulles Airport Access Highway will remain open for motorists heading towards Dulles Airport. All ramps along the route will be open except for the ramp from northbound Route 28 to Dulles. A detour will be posted directing Route 28 traffic to the next exit (Route 606) then back to the airport. The eastbound Dulles Greenway ramp to Dulles Airport will remain open. All traffic exiting Dulles Airport will have two options: 1) Bear left to follow the eastbound Dulles Airport Access Highway to Route 7 in Tysons Corner. No other exits from the Access Highway, including I-495 and I-66 will be available from this route. 2) Bear right to Access the Dulles Greenway westbound, or Route 28 north or south. Traffic leaving Dulles Airport for Maryland, Washington, DC or any point along the Toll Road will need to select an alternate route based on the options above.